Congratulations to Prince Edward County Field Naturalists and to their lawyer, Eric Gillespie, and his team. Fittingly, on the anniversary of D-Day the Environmental Review Panel found that the remedial measures proposed by Gilead and by our Government were not acceptable and revoked Gilead’s Renewable Energy Approval for seven turbines, all to have been located on Government land and within a designated Important Bird Area. All that now remains is for Premier Wynne to grasp the nettle and kill the project once and for all. The proposed project made no sense from the get-go. But even so it took hundreds of thousands of dollars of money from County residents without benefit of tax receipts and six years of PECFN courage and persistence to achieve the result that should have been obvious even to the closed minds at Queen’s Park. Much of the reasoning and precedents cited in the Gilead ERT decision will be of considerable help to APPEC at its July remedy hearing before its own White Pines ERT and to Amherst Island, whose ERT concludes today. Blanding’s Turtles abound in both places. And also to us at CCSAGE NATURALLY GREEN in our application for Judicial Review of the whole, sorry, Green Energy Act fiasco. A much-needed shot in the arm, indeed. At the direction of the Appeal Court of Ontario, the Ostrander Point ERT sat again on September 2, 3 and 4, 2015 to consider the Gilead’s mitigation plan to reduce harms to Blanding’s turtle resulting from the construction and use of access roads. About 120 County residents attended on the first morning to show their support for the PECFN appeal. There were few, if any, residents supporting the other side. The plan relies heavily on the use of gates on access roads to reduce public vehicular traffic. PECFN called two witnesses, both of whom testified during the earlier phase of the ERT — Dr. Fred Beaudry, an expert in Blanding’s turtle and Kari Gunson, an expert in road ecology. Both demonstrated strong and relevant knowledge and gave compelling evidence, supported by scientific papers and personal experience as to why the access roads would be problematic even with gates. While both agreed that gates would reduce public access to a considerable extent, they also stated that there is little or no scientific evidence that other proposed mitigation measures will be successful. Concerns about the impact of access roads include: heavy equipment movements during construction, fragmentation of habitat, barriers to movement of more timid turtles, changes to water flow and pooling, encouragement of invasive plant species, provision of appealing but easily seen nesting sites on the shoulders, and improved access within the site for poachers, predators (foxes, raccoons, skunks) and the public (some will intentionally kill turtles). PECFN’s witnesses expressed particular concern about adult mortality, because Blanding’s turtles don’t mate until at least age 20 and have a low reproductive rate. Dr. Beaudry emphasized that the cumulative effects of the many factors relating to roads would result in inadequate mitigation of harms. Both witnesses were cross-examined in detail by the lawyers for MOECC and the developer, and both held up well. To observers supporting PECFN, it was difficult to understand how the developer’s mitigation plan could justify proceeding with the project. 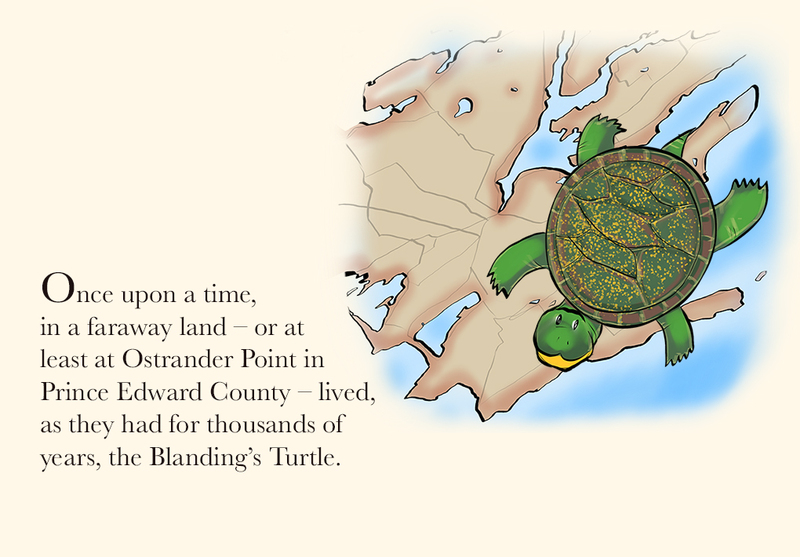 In the summer of 2013, Jim Coyle wrote about how the tiny Blanding’s turtle managed to thwart the development of nine massive wind-turbine generators in Prince Edward County, much to the joy of local residents and nature activists. It was a very human story, full of human characters, human politics, an human point-of-view. The following is a recap of that story but from a very different, hyperlocal perspective. How a wind turbine project near Ostrander Point was brought into question by some local turtles. Prince Edward Point [at the eastern end of the South Shore of PEC] quite often surpasses Point Pelee in terms of abundance and densities of birds. In fact, nowhere else along the north shore of Lake Ontario do the numbers of migrants (spring and fall) compare with those found at Prince Edward Point. The only difference is that birds of southern affinities that are more or less regulars down there, may only be found in ones and two at Prince Edward Point during migration – Worm-eating Warbler, Kentucky Warbler, etc. We refer to these southern birds as “over shoots” – southern birds that migrate north a bit farther than they should. Much like a braking car going through a stop sign. We are finding that an increasing number of Quebecers are making PEPt their destination rather than Pelee, as it is closer for them. While Prince Edward Point is where birds tend to congregate, much the same can be said for the entire South Shore. Birds arrive en masse all along the shore and gradually work their way along the shoreline to PEPt proper. They are seeking the shortest route across Prince Edward Bay and the Bay of Quinte on their way northward to the boreal forests where many of these species traditionally nest. 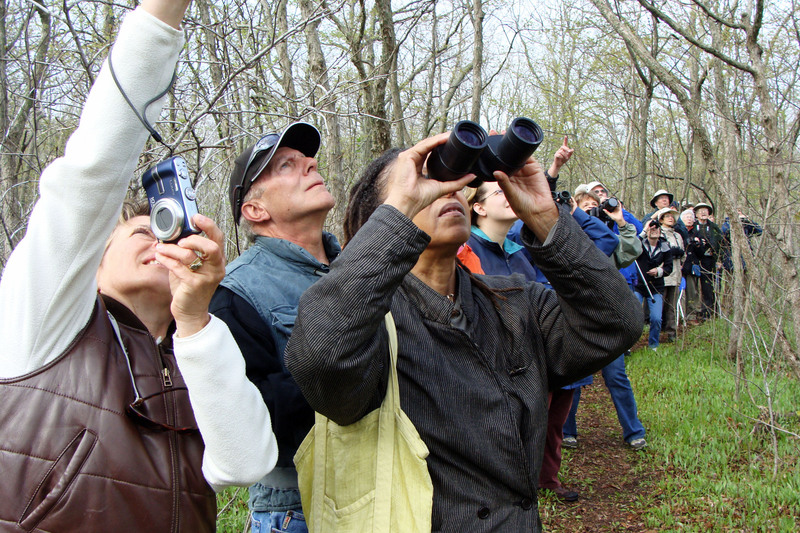 We did our Birdathon yesterday [May 11, 2015] and came up with 131 species, all but a few having been found at the Point and along Army Reserve Road. We spent almost an hour at Ostrander Point Road where the fallout of warblers there was phenomenal in the wet wooded area about half way down the road. Prince Edward County Field Naturalists’ (PECFN) appeal to the Court of Appeal relating to Gilead Power’s Ostrander Point proposed wind factory of 9 turbines was held over two days in mid-December, 2014. The Court’s 33 page decision was released today. Most importantly, it “… restored the Environmental Tribunal’s conclusion that the project will cause serious and irreversible harm to the Blanding’s turtle”. When the ERT originally reached that conclusion it revoked the Renewable Energy Approval (REA) issued by the Director for the Ministry of the Environment. Thus with the Court of Appeal’s decision, Gilead Power has no REA. 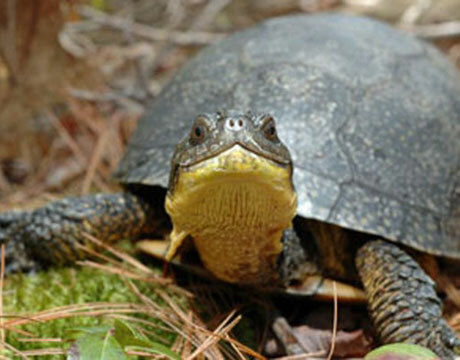 However, the Court of Appeal also determined that certain evidence that Gilead Power might have given before the ERT on how it proposed to protect the Blanding’s turtles by excluding the public from the 5.4 kilometres of access roads to the turbines was not, and was not able, to be given. The Court ordered that this aspect only should be referred back to the ERT to hear such evidence (but no other). PECFN is confident that such evidence will conclusively show that Gilead Power’s proposal to erect gates will in no way change the continuing serious and irreversible harm to the turtles because of other major threats which were exhaustively canvassed before the original ERT. Gilead Power cannot proceed with construction and many months will likely go by before an ERT hears the evidence in question and arrives at a decision on that point alone. Meanwhile, Gilead Power has no REA. Now we know what the stacks of paper before the 3 Judges and 12 lawyers were all about. During the day, the lawyers for Gilead and for the Ministry spent a mind-numbing three hours and six minutes concentrating on one theme. To do so, each constantly referred the Judges to pages among the many thousands in those stacks, which contained the complete transcript of the proceedings before the Environmental Review Tribunal and the Divisional Court. The theme on which they concentrated was this: the duty of a Tribunal and of a Court is -as a matter of law – to be reasonable in arriving at decisions. In their view, the decision of the ERT was unreasonable on its face and therefore the decision of the Divisional Court to overturn it was its reasonable duty. In advancing this view, it was necessary constantly to refer to many different phases of evidence given at the ERT and to comments of the Tribunal members. This they did for the period indicated. In particular, the evidence given by Dr. Beaudry before the ERT and its effect on the Tribunal came in for scathing criticism. Towards the end of a long day, the lawyer for CanWea (the trade association of the wind industry) struck a different and shorter note by contending that the decision made by the ERT was completely beyond its powers to make, and that it should have been made in the public interest, the requirement made of the Director under the Green Energy Act in whose shoes, it was said, the ERT stood. Rebuttal remarks were provided by Chris Paliare, counsel for SSC, directed at the mortality to the turtles which would be caused by the nine access roads required, the amount of concrete and heavy equipment which would be moved along those roads and installed in, under and on the land. Eric Gillespie finished the hearing on behalf of PECFN with additional comments demolishing so-called points made by the opposition. Justice Cronk thanked all counsel for their helpful submissions (a normal courtesy) and asked them to return in one week for a preliminary discussion about costs. Her final remark was possibly the most intriguing of the day – “our decision will not be ready before Christmas”. Given that the Court of Appeal decisions normally take up to six months, could this mean that it might be available in the first month of the New Year? We will see; meanwhile those of us in the County who feel strongly can rest assured that our concerns were dealt with by a highly competent Bench in an open and transparent manner, and by outstanding counsel for PECFN, SSC and Nature Canada. And finally from this correspondent on behalf of us all, congratulations to Prince Edward County Field Naturalists and to South Shore Conservancy for courage, devotion and a sense of what is right far above the norm. Who’s up for a Horn Trip? Today, Dec. 8, 2014, was the PECFN day at the Ontario Court of Appeal. Eric Gillespie led off followed by Chris Paliare (for SSC) and Steven Hazell (for Nature Canada). The day was devoted to arguments about serious and irreversible harm as it applies to the Blanding’s Turtle. The testimony of Dr. Fred Beaudry was dissected and analysed. Issues which were discussed included: critical habitat to species at risk (the turtle), the danger to the population due to roads – because Blanding’s have to be 25 years old before they can sucessfully mate – they lay only 10-12 eggs every second year and the eggs are very vulnerable to predation. Roads are the common link that increase the dangers listed above. The 5.4 km of road associated with Industrial Wind Turbine development at Ostrander Point would most likely cause eventual extinction of the already precarious population. About 25-30 PECFN supporters filled the spectators benches today. Tomorrow we will hear from the people who support the idea that Industrial Wind Turbines belong at Ostrander Point. An aggregation of advocates (12 altogether) and a blizzard of paper (stacks well over a foot tall in front of each lawyer and judge) faced Justices Cronk (chair), Epstein and Juriansz in Courtroom 2 in historic Osgoode Hall at the opening of the appeal by Prince Edward County Field Naturalists of the overturning of the original Environmental Review Tribunal’s favourable decision by the Divisional Court. The public seats were packed with people from PECFN, South Shore Conservancy, CCSAGE, APPEC, the wider County and Amherst Island. There appeared to be a media presence. The day was almost entirely taken up by presentations by Eric Gillespie for PECFN, Chris Paliare for SSC (an intervenor) and by counsel for Nature Canada (also an intervenor). During the last half hour Neil Finkelstein started the case for Gilead Power. Tomorrow will see Gilead complete its case, followed by counsel for the Ministry and for the trade association of the wind industry (also an intervenor) respectively. No decision by the Court is expected for months. It should be clearly understood that these three Justices do not inhabit some unreal, impractical, world. Two of them were prominent court room lawyers in the front rank at their time, with significant experience of realities. None of the three was reticent, and all asked penetrating questions of counsel throughout the day. The reputation of the Ontario Court of Appeal stands high in the western world, not least because of the calibre of its members. However, this is not a new trial. There are no witnesses and new facts or evidence cannot be produced. The Court can look only at the actual evidence given at the ERT and at the conduct of the ERT and Divisional Court hearings to determine whether some mistake at law was committed along the way. The ERT decision was based on serious and irreversible harm to animal life (the Blandings turtle) ; regretfully the obvious common sense perception that Ostrander Point is the stupidest place to put industrial wind turbines being slap in the middle of one of Canada’s most prolific migration flyways cannot be considered by the Court nor can any other extrinsic issue. Nothing sensational emerged at today’s hearing. All counsel on our side performed well and made telling points. Tomorrow will produce the no doubt somewhat different perspective of the opposing parties. In the fight against wind in the wrong places, there is no doubt that legal history is being made at Osgoode Hall. It remains to be seen on which side it falls. Prince Edward County Field Naturalists will be at the Appeal Court of Ontario on Dec 8-9 defending the Environmental Review Tribunal ruling that overturned the Ministry of the Environment’s approval of the Gilead wind turbine project at Ostrander Point. This is a precedent setting case that impacts the validity of the Environmental Review Tribunal, the Endangered Species Act and the Environmental Protection Act. Funds are still needed to defend the Tribunal ruling. 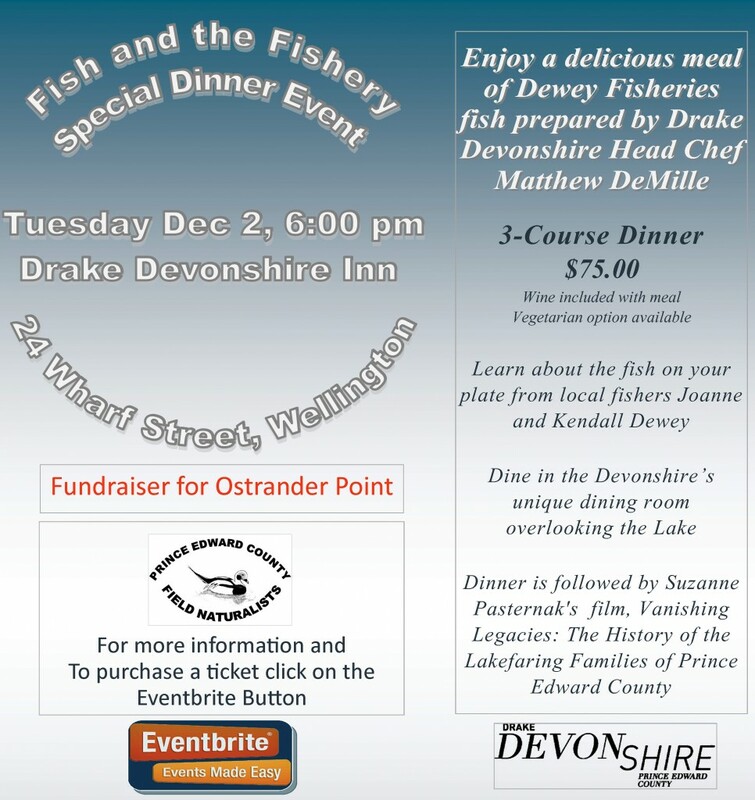 Fund Raising Dinner – Fish and the Fishery, Tuesday Dec 2, 6 pm, Drake Devonshire Hotel, Wellington. This event will be held on December 2 at the Drake Devonshire hotel in Wellington. Continuing with the theme of the Culture and History of the South Shore introduced at the Regent Theatre event on November 27, this evening celebrates the fish and fishery of Prince Edward County.